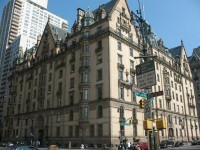 Rachel Galvin has joined the team at Campfire Productions to help with the making of “Dakota Documentary,” a documentary about the iconic Dakota Apartments in New York City. Being a History major, Galvin is pleased to be doing research on the history of this landmark. To find out more about this project, directed by Scott Cardinal, visit www.dakotadocumentary.com. This entry was posted in Acting, Gallery and tagged Dakota Apartments, Rachel Galvin, Scott Cardinal. Bookmark the permalink.